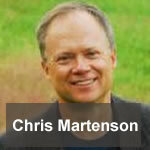 Chris Martenson, PhD (Duke), MBA (Cornell) is an economic researcher and futurist specializing in energy and resource depletion, and co-founder of PeakProsperity.com (along with Adam Taggart). He is also author of the book “Prosper! : How To Prepare for the Future and Create a World Worth Inheriting” As one of the early econobloggers who forecasted the housing market collapse and stock market correction years in advance, Chris rose to prominence with the launch of his seminal video seminar: The Crash Course which has also been published in book form (Wiley, March 2011). It’s a popular and extremely well-regarded distillation of the interconnected forces in the Economy, Energy and the Environment (the “Three Es” as Chris calls them) that are shaping the future, one that will be defined by increasing challenges to growth as we have known it.